Once per turn: You can shuffle 1 "Altergeist" card from your hand or face-up from your field into the Main Deck; add 1 "Altergeist" monster from your Deck to your hand. Altergeist Marionetter and the snake-like creatures that compose Altergeist Primebanshee appear in this card's artwork. 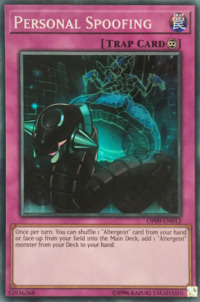 When activating the effect of "Personal Spoofing", you must return a face-up “Altergeist” card on your field, or one in your hand, to the Main Deck. Since "Altergeist" Link monster cannot be returned to the Main Deck, so it cannot be used for the cost of "Personal Spoofing".